Brassinosteroids (BRs) are the steroidal plant hormones that play a pivotal role in growth and development of plants. They are ubiquitous within the plant kingdom and are well known for their pleotropic effects including growth, rhizogenesis, seed germination, flowering, maturation, senescence and abscission. 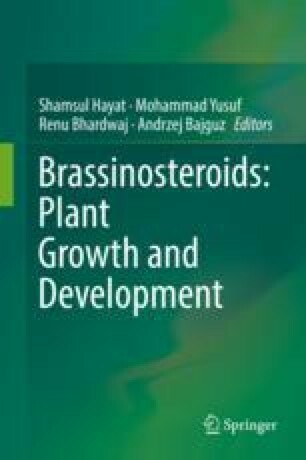 In the past recent years, brassinosteroids are in the limelight for their potential to confer abiotic stress tolerance in plants. They are known to modulate a plethora of stress responsive pathways that in turn promotes the vigor of the plant under unfavorable conditions. The use of different genetic, biochemical and molecular tools have provided us convincing evidence and valuable insights on the regulation of abiotic stress tolerance using BRs. However, in depth knowledge of the different mechanisms how BRs confer abiotic stress adaptation in plants is still elusive. The present chapter is focused upon understanding the current knowledge of BR mediated abiotic stress tolerance in plants and highlighting the knowledge gaps in the area.